Root canal therapy is one of the most highly debated procedures in dentistry. In spite of the fact that it is performed quite frequently, its limitations and its long-term consequences still remain under discussion amongst dentists from all over the world. From a holistic medical standpoint, root canal therapy can be extremely dangerous for the body if performed by using the traditional approaches. However, a generally accepted alternative to the procedure has yet to be found in the field of holistic dentistry. Nonetheless, there are some general holistic principles in regards to this procedure that constitute the guidelines adopted by the vast majority of holistic dental practitioners. In order to fully understand the struggle of finding the best possible holistic alternative to traditional root canal therapy, let us take you through the basic ideas about the procedure. Therapy for a root canal becomes necessary when the pulp of the tooth becomes infected with bacteria. The pulp is the part of the tooth which includes its nerve supply, arterial, venous and lymphatic system. The pulp is covered by the dentin layer and the enamel layer. 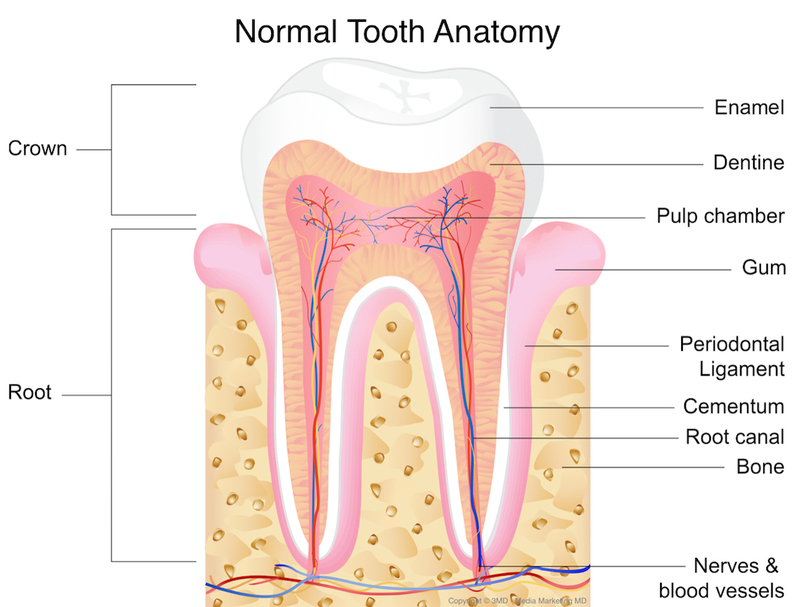 When access through these two layers occurs, cavities in a fissure for example, bacteria reaches the pulp region. Bacterial access to the pulp chamber or root canal also occurs with gum disease (deep gum pockets) and fractures of the tooth. If a cavity is not treated in due time, an infection in the pulp might appear. Often the patient will not feel pain in the early stages, and he might not even be able to see the fissure as it could be too small to see with the naked eye. However, if the infection is allowed to progress, then the patient may experience light pain when chewing or clenching his teeth. When the infection spreads to the tooth’s dentin layer and gets close to the nerve, the intensity of the pain experienced by the patient may increase considerably, up to the point where it’s so severe urgent medical intervention is mandatory. In order to clear the infection site, the dentist needs to remove the upper portion of the enamel and dentin, to get to the pulp and respectively the root canal system. Root canal therapy may require several sessions so that the doctor can clean it properly. During the first session, the root canal will be cleaned mechanically with endodontic files. Then the doctor will add a chemical agent meant to remove any nerve portions left along the root canal and to kill the remaining bacteria at this site. Another chemical agent may be placed and will have to remain there for a few days. The doctor will have to add a temporary filling to the tooth to fill in the opening that was made at the beginning of the procedure. It is essential that the filling is applied so as to prevent food an d additional bacteria from getting into the opened root canal. During the second session, the doctor will remove the chemical agent and examine the surface of the root canal thoroughly. Then he must conduct additional cleaning of the area by using another dose of the chemical agent while scraping and smoothing the rough, irregular sides of the pulp chamber and root canals. At the end of the session, another temporary filling will be applied to secure the tooth. The third session is usually the last one necessary for the procedure. If the root canal is clear of infection, inflammation, and nerve remainders, then it can be cleaned one last time and then filled. However, if the doctor considers that another dose of the chemical agent is necessary, a fourth session will be required. At the end of the procedure, the dentist will add a permanent filling or a crown, which will secure the tooth for a long period of time. Root canal therapy is generally not a painful procedure. For each of the sessions, the patient will be administered a local anesthetic and he/she may only feel short episodes of tenderness during the mechanical cleaning of the canal. However, after the procedure, the patient is expected to feel some level of pain due to the inflammation caused by the mechanical cleaning. Therefore, analgesic and anti-inflammatory medicine will be administered shortly after each session and for several days after, until the pain disappears completely. Root canal therapy has reasonable chances of success, but no doctor can offer a complete guarantee. In spite of the fact that the dentist might perform the procedure flawlessly, there is always the chance that a small fraction of the nerve will remain. This bit of nerve tissue will then deteriorate due to remaining bacterial infection or due to a lack of nourishing blood supply. This occurs due to the intricate, irregularly shaped anatomy of the root canal itself. While the nerve and the canal might appear to be linear on an X-ray, in reality, they are shaped like the branches of a tree. Therefore, the linear files used to clean the canal might not be able to reach all the sections of the nerve. Moreover, the chemical agent used to destroy the remaining nerve portions might not be able to reach absolutely all the remaining nerve branches. If this happens, local inflammation occurs and the patient begins feeling pain again. In this situation, the doctor needs to reopen the root canal and perform supplementary mechanical and chemical cleaning. Additional sessions might also be necessary afterward, but a second intervention is hopefully enough to complete the procedure. In spite of the doctor’s best efforts and intentions, deteriorating residual nerve may not be identified as the cause of low level irritating pain until years later. Another common situation that occurs after root canal therapy is immediate recurring infection along the canal. This is precisely why the attempt to sterilize it as best as possible is crucial to the success of the procedure. In this case, the patient may experience intense pain and the doctor will have to reopen the canal and redo the entire treatment. If the doctor does not apply reasonable “sterilization” efforts while performing therapy for a root canal, the risk of recurring infections is quite high. This aspect is particularly concerning because the infection could lead to complex conditions in either the upper jaw or maxilla or the lower jaw the mandible. From a holistic standpoint, root canal therapy is extremely dangerous because it is virtually impossible to assure complete sterility of the canal prior to closing it. Therefore, preserving any residual bacteria in a closed space (the canal after it is filled with cement and secured) is a risk that patients should not be taking. This is the main reason why the vast majority of holistic dentists will recommend extracting the tooth instead of performing root canal therapy. If the tooth is removed completely, it is removed with the bacteria as well. Therefore, the source of the problem is eliminated. However, more conservative holistic dentists regard this measure as being extreme. A dentist’s main goal should be to preserve the natural tooth as long as possible because the artificial replacement will never live up to the quality of the natural one. The root canal therapy session needs to be conducted in as sterile an environment as possible in order to minimize the chances of oral bacteria getting into the canal. The room in which the procedure will be performed therefore needs to be carefully disinfected. This is the standard of care in dentistry and nothing below it is acceptable in holistic medicine. A thorough sterilization of all the equipment used for the procedure is essential to its success. The doctor will have to use sterile gloves, as well as a surgical mask, in order to minimize the chances of inadvertent contamination of the patient. The standard of care for root canal therapy entails the use of rubber dam isolation. This is similar to a surgical field but it is made out of rubber or neoprene for those patients allergic to latex rubber. It is meant to prevent saliva from the patient’s mouth, which is rich in bacteria from entering the root canal system. Moreover, exactly like a surgical field, the rubber dam maintains a clean treatment field so that the procedure can be performed to approach the highest levels of sterility. The most common chemical agent used by traditional dentists to disinfect the root canal system prior to closing it is sodium hypochlorite. This is the same substance found in bleach products such as Clorox. And while it remains debatable whether or not using the substance in the root canal is safe for the patient or not, one thing remains absolutely clear: sodium hypochlorite alone cannot perform a high-quality sterilization of the canal. This type of laser is used for Photo-Induced Photoacoustic Streaming (P.I.P.S.) procedures. This makes use of the energy of the laser to destroy bacteria, fungi, and yeast. On one hand, it performs a superior decontamination of the canal walls and on the other hand, it regulates the structure of the canal that might remain crumpled after mechanic cleaning procedures. 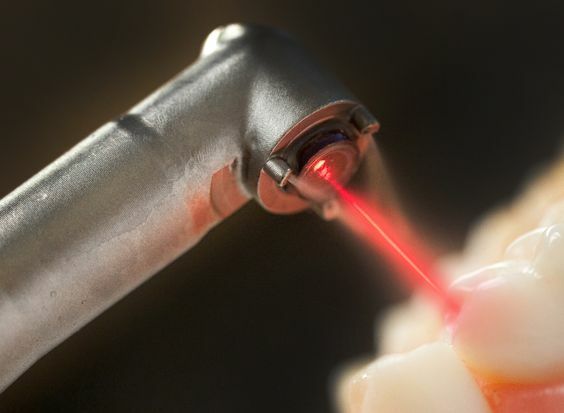 This is another type of laser that can be used to eliminate bacteria and fungi from the root canal. The decontamination of the dentinal walls can be performed up to 1000 microns deep into the wall, thus producing a high-quality disinfection of the site. Ozone is not harmful to eukaryotic cells, which are found in the human body. However, it immediately kills single cell organisms, such as bacteria, fungi, and parasites. It can be used in a liquid solution, as ozonated water alongside P.I.P.S. or it can be used as ozonated gas to clean the canal. The gas form is recommended, by some, to be used as the last step of the procedure in an attempt to provide maximum decontamination. 2. Using high-quality materials to seal the root canal. They must have antibacterial properties. They must form a continuous and impenetrable block with the tooth. 3. Minimizing the number of sessions necessary for performing the entire procedure. Due to the fact that the traditional root canal therapy is spanned over several sessions, there is a high risk that the patient will not miss the last one, during which the permanent filling is applied to the tooth. Taking into consideration that in most cases the pain has already receded before the last session of the root canal therapy, the patient might be tempted to postpone it or even miss it altogether. Temporary fillings are only secure for a limited amount of time, after which they can be easily penetrated and, therefore, bacteria can get into the canal. In order to maximize the success of the root canal therapy, the doctor must reduce the number of sessions as much as possible. The ideal amount is two so that the agent used to destroy the remaining sections of the nerve is allowed to act and so that the dentist can examine the canal prior to sealing it. Only if the canal is clear upon examination will the doctor continue to apply the decontamination procedures and seal it permanently. Since root canal therapy cannot render a tooth completely sterile there is always residual bacteria that may be held in check by a healthy immune system. Success when describing root canal treatment is considered to be five years with no recurrence of visible suspicious changes on subsequent x-ray examination. Success also requires no perceptible symptoms reported by the patient. A special DNA test is available to determine whether bacteria known to be bad actors are present in a patient’s mouth adjacent to a root canal treated tooth. This test can provide additional evidence of concern in addition to visible x-ray image changes along the root of a tooth or if patient symptoms are present and a discussion of tooth removal is on the table.